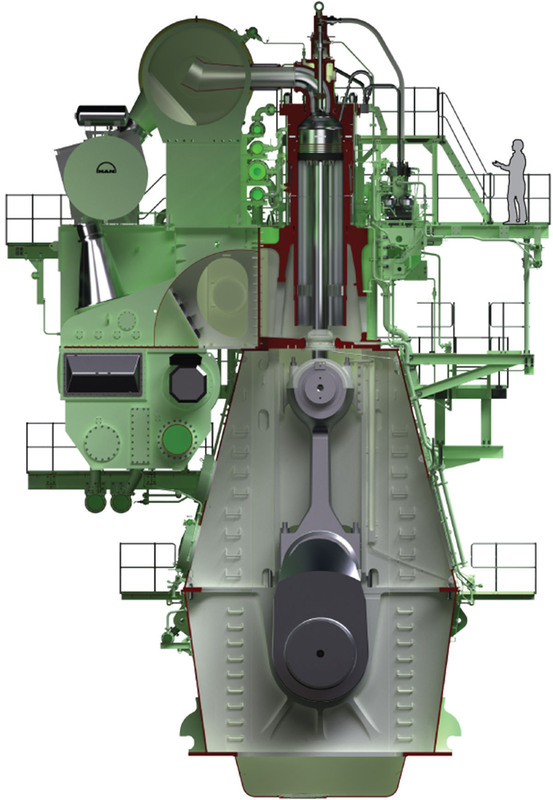 Two Greek shipping operators have recently selected one of MAN Diesel & Turbo’s newest, two-stroke, main engines – the G95ME-C – as prime mover for two series of, respectively, 9,000- and 11,000-TEU container vessels. The G95ME-C9.2 ranks among the largest and most powerful engine the company has ever released to the marine, two-stroke market. The orders cover five confirmed engines – 3 + 2 for the 9,000-TEU series and 2 + 2 for the latter – and one of MAN Diesel & Turbo’s Korean licensees will construct the engines. Originally announced in July 2013, MAN Diesel & Turbo states that the G95ME-C was developed specifically for the large, modern container vessel segment and is optimised for efficiency and green technology. HHIC Phil (Hanjin Heavy Industries Corporation Philippines) will construct the five vessels. MAN Diesel & Turbo’s G-type programme (‘G’ for Green) entered the market in October 2010. The ‘G’ prefix before an engine means it has an ultra long stroke, which in combination with lower rpm and a larger propeller paves the way for ship designs with unprecedented high efficiency. Together with an optimised engine design, this reduces fuel consumption and reduces CO2 emissions. The engine design follows the principles of the large-bore, Mark 9 engine series that MAN Diesel & Turbo introduced in 2006. Since its introduction, in excess of 400 engines have borne the G-prefix.